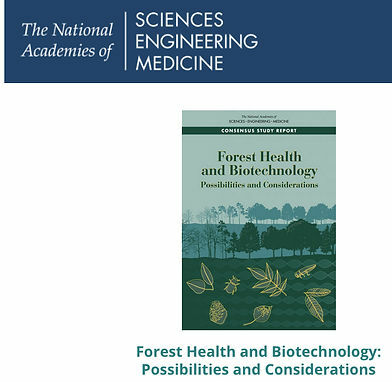 New York–In its report, Forest Health and Biotechnology ; Possibilities and Considerations the National Academies of Sciences, Engineering, and Medicine warns that current regulatory structures are not sufficient to provide oversight of biotech trees. Researchers at the SUNY Syracuse School of Environmental Science and Forestry are expected soon to submit an application requesting the deregulation of an American chestnut tree genetically engineered to resist a deadly blight. It would be the first GMO plant approved for planting directly into wild ecosystems with the intent of spreading uncontrollably and with no follow up to monitor impacts. They further warn, “as is the case with other biotech plants, some biotech trees could become commercial products without any oversight by the three regulatory agencies.” The USDA, which is the U.S. agency specifically tasked with regulating biotechnology products, does not currently require oversight for all biotech applications, but only those that could be considered a “plant pest.” Genetically engineered trees transformed using other technologies could be released into the environment with no regulation at all. “The arcane, decades-old regulations being used by federal agencies to address the potential impacts of releasing long-lived GE trees into forests are entirely inadequate, and I am very glad the NAS is raising this concern as well,” said Anne Petermann, Executive Director of Global Justice Ecology Project. Petermann testified before the NAS during a hearing on risks, concerns, potential problems of using biotechnology to address forest health, which was part of the year-long study that produced the new NAS report. (You can read an OPED on the topic by Anne Petermann and colleagues in The Hill here). “If these trees are deregulated and released into wild forests, there is no mechanism to monitor them, no way to know the impacts they are having, and now way to call them back if a problem emerges at any time over the 200 year lifespan of the tree. These trees must never be released into the wild. The report also concludes that although there are mechanisms in place to alert neighboring countries about genetically engineered forest trees that could enter their territory, a lack of monitoring means GE trees could migrate across national borders without notice. In the case of GE American chestnuts, they could easily cross the border into Canada. GE Chestnut White Paper: Dr. Rachel Smolker and Anne Petermann are producing a White Paper detailing the issues, concerns, risks and science behind the genetically engineered blight resistant American chestnut tree. The paper is currently under review and will be available soon. To be added to the list to receive it when it is released, please send an email to info@globaljusticeecology.org.